Last week my boys went back to school. They are both in high school now, so the quiet of our empty house during the day is even more of a reminder that in a few short years we will have an empty nest. I can’t even think about it! So I made cupcakes—Dark Chocolate Cupcakes with Biscoff Buttercream Frosting. I had not tried Biscoff Spread before, but after reading all the rave reviews on the internet and checking out all kinds of recipes using it, I knew this cookie butter would be good. But I really had no idea just how good it would be, especially in buttercream frosting. For the cupcakes I used Hershey's Special Dark Cocoa which makes them almost black in color. They were delicious as well. I ended up with lots of frosting left over, so I guess I will have to make more cupcakes. 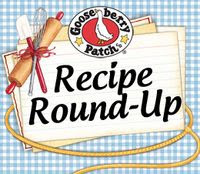 I am posting the recipes as I made them, but if you want to give these recipes a try you could easily cut the frosting recipe in half or double the cupcake recipe. Or, you could double the amount of frosting you put on your cupcakes! Cupcakes made with Hershey's Special Dark Cocoa and topped with creamy Biscoff buttercream frosting. 1. Preheat oven to 350°F and line muffin tin with paper liners.2. In a large bowl whisk together the flour, sugar, baking soda, baking powder, and salt until combined; set aside.3. In another large bowl combine the cocoa and the hot water; add the eggs, buttermilk, oil and vanilla and beat until combined.4. Add the dry ingredients into the wet ingredients and mix until smooth.5. Scoop batter into prepared pans and bake for 20-22 minutes or until tops spring back when touched; remove from pans and allow to cool completely before frosting.5. To make the frosting, beat together the butter and the Biscoff Spread; gradually add the confectioners' sugar and mix at low speed until combined. To achieve the desired consistency, gradually add milk to thin frosting. Or, if the consistency is too thin, gradually add small amounts confectioners' sugar to thicken. Pipe frosting onto cooled cupcakes as desired. Cupcake recipe adapted from Martha Stewart and frosting recipe adapted from Biscoff. Jill those are so pretty and they look quite dainty on the individual stands. Wow, I cannot believe how dark these cupcakes are with that special dark cocoa powder! 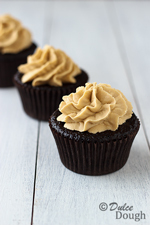 What a fantastic combination with that yummy cookie butter frosting! I love that stand. Looks beautiful, you are right, kids grows up fast. My younger one is now 7 month and it is like yesterday I had him. This cupcakes is delicious, love that frosting too. No but seriously, these cupcakes are absolutely stunning, and I've just recently become biscoff-obsessed so I am incredibly excited to make this! These look so incredibly delicious. We don't get Biscoff here in the UK so I get terribly jealous when I read all these amazing recipes including biscoff. I hear you can make it yourself but if I do that, I won't know whether my cookie butter would taste anything like it's supposed to, ya know? These cupcakes are truly a beauty. The swirls are so perfect. i love biscoff and chocolate together and your cupcakes look great! I love Biscoff and chocolate and your cupcakes look amazing Jill! What a wonderful combination...I've seen Biscoff before but never used it. This recipe inspires me, as I love chocolate! I know it's hard to think about; but believe me, once your boys leave home, your days will remain full. Actually, they never really leave; your family will just grow!